in 1863, in Olpe, Germany. 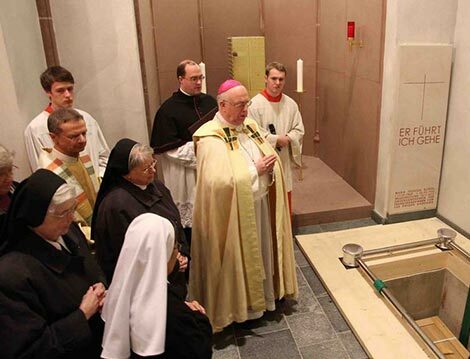 The Sisters of St. Francis of Perpetual Adoration at Mount St. Francis rang the church bells in Jubilation when they heard the news that Venerable Mother Maria Theresia Bonzel had been declared Blessed. Mother Maria Theresia founded the Sisters of St. Francis of Perpetual Adoration in Olpe, Germany in 1863. 2013 marks the 150th anniversary of the Congregation’s founding. Colorado Springs, Colorado is one of four Provinces of the Sisters of St. Francis with others in Mishawaka, Indiana; Cologne, Germany and BayBay, Leyete, in the Philippines. There is a mission in Brazil and the Generalate is in Olpe, Germany. Although Mother Maria Theresia Bonzel died on February 6, 1905, still, her work continues. The Sisters of St. Francis of Colorado Springs continue to serve God’s people, the poor and vulnerable in California, Colorado, Nebraska, and New Mexico. Partnering with the laity and with other religious communities, the Sisters’ ministries embody the Franciscan Core Values of sacredness of persons, care of the poor, joyful service, partnership, stewardship and holism. All of these services spring from the vision and courage of the first, and founding Sister of Saint Francis of Perpetual Adoration, Blessed Mother Maria Theresia Bonzel. Along with various events celebrating the 150th of the Congregation, the Sisters will now add other jubilant festivities to commemorate this momentous year. The Sisters of St. Francis of Perpetual Adoration at Mount Saint Francis were delighted to learn that Pope Francis declared that henceforth the foundress of their Congregation, Mother Maria Theresia Bonzel, will be invoked as Blessed. The officially recognized miracle attributed to Mother Maria Theresia Bonzel’s intercession occurred in February 1999. On January 26, 1999, Jan Burgie called Mount St. Francis and asked for prayers for her then 4 year-old son, Luke, who was suffering from an undiagnosed case of severe/chronic diarrhea since September 1998 and was scheduled for a CAT scan at Children’s Hospital in Denver, CO. Sr. Margaret Mary Preister sent Jan Burgie several prayer cards of Mother Maria Theresia and she herself and Sr. Evangeline Spenner prayed it every morning for Luke’s recovery. When the then Superior General, Sr. Mediatrix Nies, Olpe, Germany, was told of this possible miracle, she petitioned Dr. Andrea Ambrosi, Postulator and Vatican Attorney, in Rome to consider it as “the” miracle necessary for Beatification, a process begun in 1961. 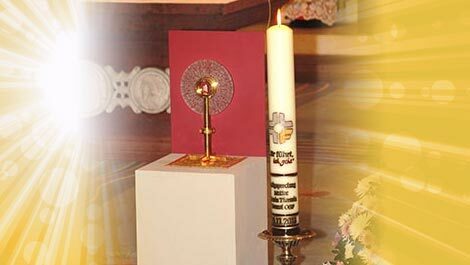 An essential part of the Beatification process was the tribunal hearing of the possible miracle held in the Diocesan office in Colorado Springs, Colorado, on February 2, 2001, and concluding the afternoon of February 27, 2001 with the final documents sealed with wax by Bishop Richard Hanifen. In accord with the request of the Congregation for the Causes of Saints in the Vatican in Rome, Luke Burgie had many doctor appointments from July 13, 2009 until September 23, 2011. Tests and more tests done in both Colorado Springs and Denver Children’s Hospital proved he was still healthy. 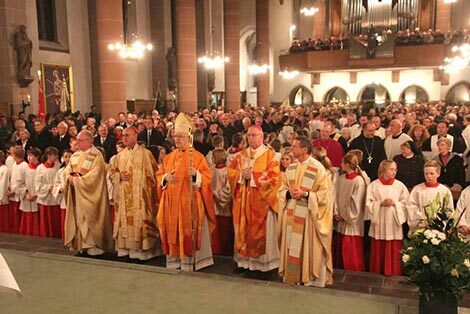 On January 15, 2013, the Commission of Cardinals unanimously agreed to this miracle of Luke’s healing for the Beatification of Mother Maria Theresia Bonzel. 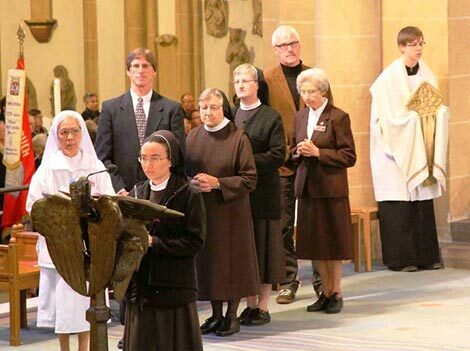 The Sisters of St. Francis of Perpetual Adoration, Olpe, Germany, are ministering in four Provinces: Cologne, Germany; Colorado Springs, Colorado; Mishawaka, Indiana; Baybay, Leyte in the Philippines; and several convents in São Luis, Maranhao, Brazil. 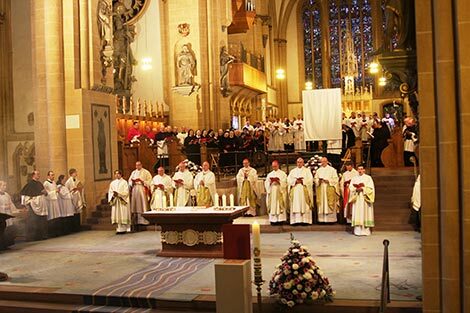 The Beatification of Mother Maria Theresia Bonzel, foundress of the Sisters of St. Francis of Perpetual Adoration, which was declared by Pope Francis on March 27, 2013, was publicly celebrated in the Great Cathedral in Paderborn on November 10, 2013. The Congregation’s motherhouse is in Olpe, Germany, with provincial houses in Cologne, Germany; Mishawaka, Indiana; Colorado Springs, CO; Baybay City, Leyte, Philippines and a mission house in Brazil. The cathedral was filled with about 200 Sisters representing the various provinces and Brazilian mission as well as hundreds of laity and clergy. 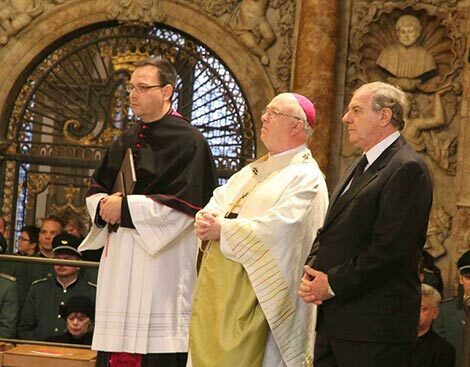 Cardinal Angelo Amato SDB, Prefect of the Congregation for the Causes of Saints at the Vatican, was the principal celebrant at the Pontifical Mass which officially accepted Maria Theresia Bonzel OSF into the circle of the blessed of the Catholic Church. 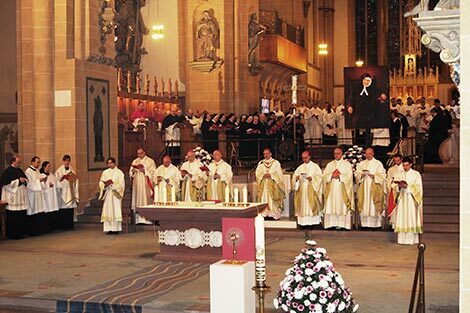 The act of beatification took place after the Introductory Rite of the Mass. 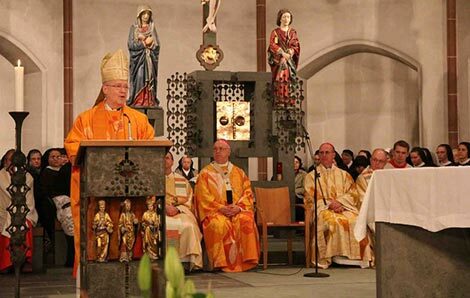 Archbishop Hans Josef Becker and the general postulator (lawyer) of the beatification process, Dr. Andrea Ambrosi, approached Cardinal Amato and asked for the beatification of Mother Maria Theresia. Sister Mediatrix Nies OSF then gave an overview of the life of the newly Blessed and Cardinal Amato proclaimed the papal decree of beatification. 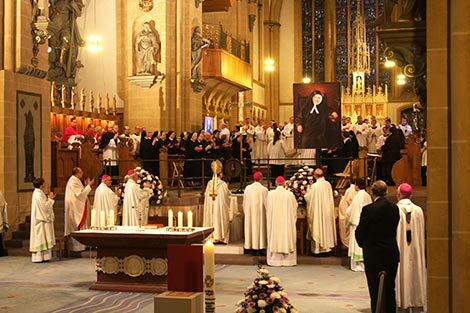 At its conclusion, the decree of beatification was enthusiastically affirmed with the congregation applauding and singing a solemn “Amen” with the choir, as a new portrait of Blessed Maria Theresia was unveiled in the sanctuary. “This moment of unveiling was a deeply moving experience for us all.” said Sister Clarice Gentrup of the Colorado Springs Province, currently serving on the General Council of the Congregation. 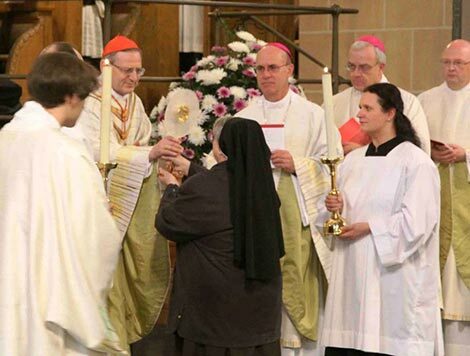 Cardinal Amato then received a reliquary containing the relic of Blessed Maria Theresia from Sister Magdalena Krol, general superior of the Congregation. The Mass continued with a jubilant singing of the Gloria. In his homily, Archbishop Becker spoke of the dignity of human life and the inseparability of love of God from love of neighbor. The General Intercessions at the Mass were presented in different languages and represented the diverse ministries of the Sisters of St. Francis of Perpetual Adoration addressing the global needs of society. 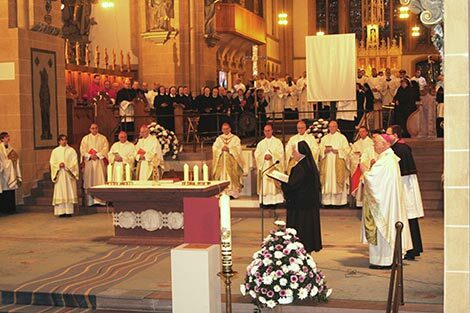 On Sunday, November 10, 2013, Mother Maria Theresia Bonzel, OSF, foundress of the Congregation of the Sisters of St. Francis of Perpetual Adoration was beatified in the Cathedral in Paderborn, Germany. 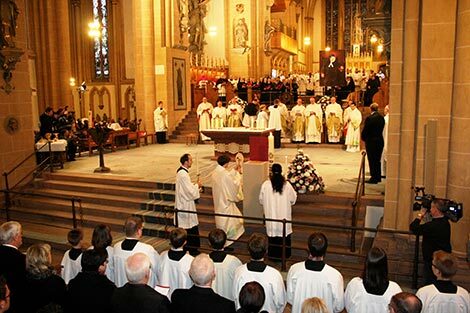 On Monday, November 11, 2013, the mortal remains of Blessed Maria Theresia Bonzel were transferred to St. Martin’s Church to be buried in the new Blessed Sacrament Chapel. 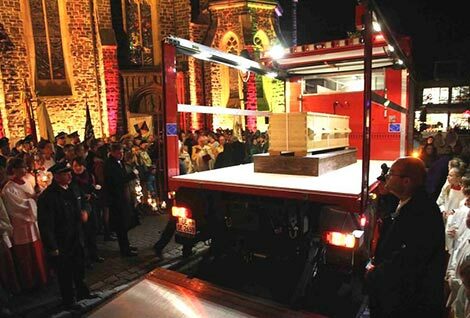 The Church bells rang while her coffin was carried to St. Martin’s Church on an open Olpe fire truck which was followed by numerous Franciscan Sisters in buses and many more devotees on foot. 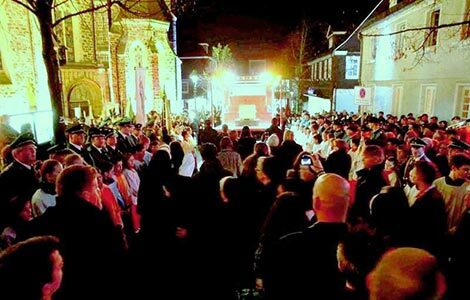 As the fire truck with the remains of the newly blessed reached St. Martin’s Church in Olpe, many parishioners came to receive “their” Mother Maria Theresia Bonzel. The people have a special relationship with Mother Maria Theresia Bonzel and her beneficent work. Before founding the Congregation, she lived with her parents in a house located just across the street from St. Martin’s Church. 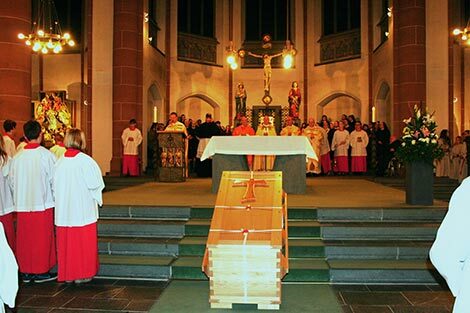 Upon arrival in the sanctuary of St. Martin’s, Blessed Maria Theresia’s coffin was placed on the steps of the altar, before being transferred to the newly designed Blessed Sacrament Chapel near the entrance of the Church. 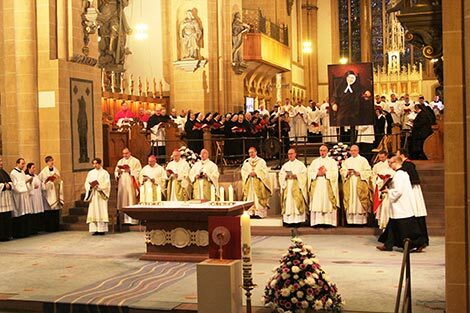 “We are grateful to Blessed Maria Theresia Bonzel, as now she returns to the place where she received Baptism and all the sacraments,” Archbishop Hans Josef Becker said as he led the funeral procession. The new Blessed was baptized in St. Martin’s Church, received her first Holy Communion, and there received the habit of her new Order. 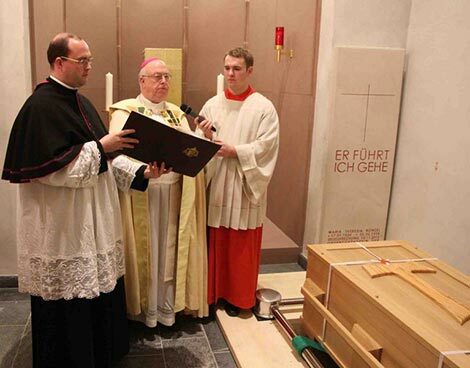 After the Te Deum, the coffin was carried to the newly designed Blessed Sacrament Chapel, which was blessed by Archbishop Becker. In his prayer he asked that the faithful who pray here may feel the closeness of God and of Blessed Maria Theresia Bonzel. 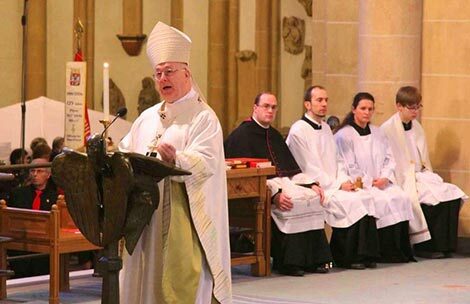 “We thank God for the example of her faith life,” the Archbishop said. 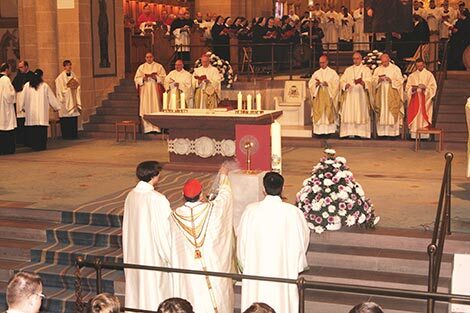 Then the remains of the new Blessed were buried in the crypt at the feet of the Blessed Sacrament. St. Martin’s Church was packed with sitting and standing crowds of worshipers for the Solemn Mass that followed the burial.